Published February 18, 2016, issue of February 18, 2016. “Senior Solutions” addresses what to do when parents can no longer live alone? The phrase “it’s complicated” probably sums it up best. Emotions can run high even in the most well-adjusted families when discussing senior living options, support services, health and financial issues. In this column, we’ll address frequently asked questions by seniors and their families. Q: We recently moved my mom into an assisted living facility close to my sister and me. She seems happy, but steadfastly refuses to participate in any of the activities. Should we continue to encourage her – or just let her be? A: Activities do play an important role in an assisted living, but keep in mind they are only one component of the day-to-day routine. In fact, meals times are probably the most social activity and a great way to create friendships. (Reviews of the food are always a lively topic of conversation!) Talk to the Executive Director and/or Wellness Director and ask their opinion as to how your mom is adjusting to her new environment. Q: What is the difference between a nursing home and an assisted living facility? Also, how do I know if my father meets the criteria to live in assisted living? A: Nursing homes, also known as skilled nursing facilities, provide 24-hour, round the clock nursing care. Residents live in one room, often shared – as opposed to apartments. Assisted living facilities offer studios, one bedroom or, in some cases, two bedroom apartments with a support staff such as a Wellness Director (RN) and aides to help residents with the activities of daily living. In terms of eligibility, all assisted living facilities will conduct a medical assessment to determine if an individual qualifies to live in an assisted living. Q: My mother and father are both in their early eighties. What should our family do now to plan for their future? A: The first step is to organize a family meeting with your parents and discuss where they envision themselves living as they get older. It’s best not to wait until a crisis such as a fall or illness occurs and you are literally forced to make a decision within days. Of course, this is easier said than done. None of us really want to think about the time when our parents can no longer live alone. Q: My husband passed away 10 years ago and I moved into a two bedroom condo. I am 85, live alone – and love it! The problem is that both my children live out-of-state and have been pressuring me to move into an assisted living. I know they worry about me, but I treasure my privacy. Are there steps I can take to reassure them while remaining in my home? A: You sound like you are enjoying your life. Certainly there’s no reason to make a change if you’re able to live independently, but there are steps you can take to ensure your safety, and allow your children to worry less. For example, make sure your home is equipped with medical alert buttons, safety devices in the bathroom and activity sensors. Many families work out a schedule where family member(s) will call in the morning, at lunchtime and again in the evening. It’s important to check in often. Plus, hearing a loved one’s voice – even for a few minutes – can create a special bond for both the senior and the family member. Rick Weisberg is president of Assisted Living Nationwide, a firm that helps seniors and their families find the most appropriate assisted living facility, based on the family’s criteria, free of charge. “Senior Solutions” appears monthly in the Jewish Journal. Contact Rick at rick@assistedlivingnationwide.com. Today there are more options than ever before in choosing an assisted living facility (ALF). There are, in fact, thousands of ALF’s across the country. How does a couple or individual decide which geographic location would be best? Most likely, there will be an assisted living in whichever location you decide to live. As you age, family is so important, for many reasons, including socialization and health care decisions. Residing in an assisted living close to one or more family members is a plus for both the elder and the family. Make it as easy as possible for families to visit the ALF. Decide upon a suburban or city setting. Maybe you are one who likes the outdoors with walking trails, gardens and many acres to explore. Or maybe, you like the city with access to theatre, movies, museums, restaurants etc. Do consider the interests, hobbies and lifestyle of the senior before touring an ALF. As you age, those long winters are quite depressing. There is a reason why there are so many assisted living facilities in such states as Florida, Arizona and California. This is definitely the plus-side to living in a warm climate in your later years. All other factors being equal, this can be a very pleasant environment for an assisted living. Not surprisingly, many people move back to the area where they grew up. There are memories, connections and familiarity. Your childhood friends my still live in the area or even be residents at the ALF of your choice. The good news is that today people have more options than ever before in choosing an assisted living facility. Think of this next step as an exciting life choice. It may very well turn out to be the best decision for you you — and yout entire family. Can an Assisted Living Program (ALP) Help You Afford Assisted Living? 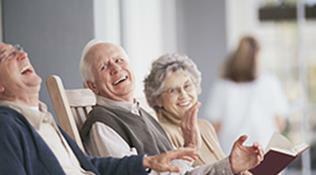 An Assisted Living Program (ALP) can help a select group of seniors afford to live in an assisted living facility (ALF). In general, an ALP provides daily assistance with personal care services (Activity of Daily Living and Instrumental Activities of Daily Living. In short, an Assisted Living Program serves as the Medicaid program for the ALF’s. Designed for those individuals who cannot afford the monthly rental at an ALF, but otherwise qualify medically to live in an assisted living facility, Assisted Living Programs are limited in availability. And not all ALF’s offer this program. However, for those individuals who qualify, an Assisted Living Program could be a tremendous resource. Most ALF’s designate only 10% of the apartments to ALP. These ALP apartments are often full and have waiting lists. Ideally, ALF’s request the individual to pay privately for 2-3 years, and then if one runs out of funds, they resident can apply for ALP. Note that this is a general guideline and changes from one ALF to another. The application process for ALP is not easy, is time consuming, and there are asset qualifications. Often times there needs to be a spendown of assets to the amount allowed by ALP, before an individual can qualify for ALP. What can one do to get into an ALP program? If an assisted living residence is the best option for yourself or a family member, there are resources available to help you decide if this program would be appropriate. Research the Assisted Living Program requirements by state and city. Most states have an Executive Office of Health and Human Services website that provides information on the ALP program. Contact an assisted living placement service such as Assisted Living Nationwide to find out the best option in your desired location. Since ALP is a complex issue, industry professionals are usually the best resource. At Assisted Living Nationwide, there is no charge to the elder or family for consultations or services. Consult an elder law attorney or a geriatric care manager who specializes in ALP. Keep in mind there are many choice in residences for seniors today. It’s important to find the right solution based upon the individual’s needs, financial constraints, desired location and physical condition. Yes, finding the right living option is a complicated process, but talking to qualified professionals is the first step in making the best decision. Let’s assume you find the perfect assisted living facility (ALF) for your parent. What’s more, you’ve found a place that meets all your criteria in terms of location, care support, activities and demographics. One would imagine that the next step would be to move in and become a resident. Not so fast! A medical assessment for prospective residents is required by every ALF prior to move-in day. The assessment is usually administered by the Wellness Director (RN) and determines if the ALF is appropriate for the prospective resident. Both physical and cognitive abilities are evaluated in these tests. In most states across the country, these assessments must be completed no more than one month prior to the move-in. Today, the majority of ALF’s now feature memory care residences. These medical assessments also determine whether the prospective resident is a candidate for these specially designated areas. Significantly, there are times where the assessment indicates that a nursing home would be a more appropriate choice. Assessments are often used when a prospective resident lives out of area and is not be able to visit the ALF beforehand. Larger ALF groups that have many locations can utilize a RN from a “sister” ALF to process the assessment. Many home care agencies process assessments, along with companies that specialize in out-of-area assessments. Assisted Living Nationwide works with companies, such as Long Term Solutions, to make sure these assessments are processed quickly. As with the entire assisting living selection process, time is always a critical factor. Ask the staff to introduce your mom or dad to a few residents and other staff members. This allows you both to become familiar with the dining room and the residents. Plan your visit for a week day, when most residents are on-site. They will have first-hand knowledge of your family member and can address any concerns or monitor the transition. Determine whether email or phone calls are the best option; feel free to ask as many questions as need be. It’s important to mix prized possession s like photos, artworks and memorabilia with new accent pieces and decorative touches. Photo collages are the perfect wall décor, adding color and familiarity. Calling every few minutes or even hours will not help the residents during the transition. Set a schedule that works for both of your schedules during the first few weeks. Don’t ask about the food! You will hear about it no matter what. Food is the most popular topic on a daily basis.